We have been in our new house for over a year and up until now, our entry way wall has been a lonely, barren white wall. It’s the first thing you see when you step inside our house. So, I didn’t want to just put anything there – and so it sat – empty, empty, empty. I was just waiting to come across the perfect frame or spark of inspiration and I finally found it! 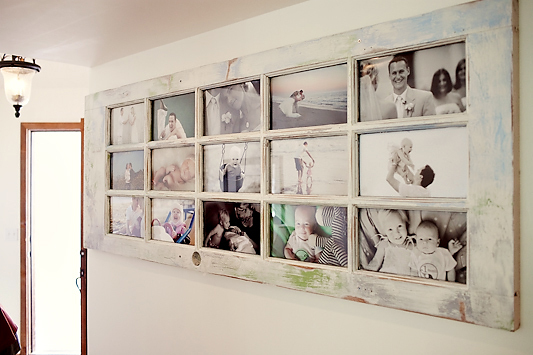 Each window serves as it’s very own frame and holds a photo that represents part of our story. The story of Mark and I – the story of our family. or at least it used to be. The very first photo is an engagement picture and the last one is of our two precious babies. This door now serves as a constant reminder of where we started, how far we’ve come and how much further we get to go. Oh, and it’s a coat rack – bonus!! It’s an old door that’s bolted to our wall with four huge screws. Good thing I love the photos in there, because I’m pretty sure they won’t be changed all that often. First things, first. You need an old door. Then, you need photos. 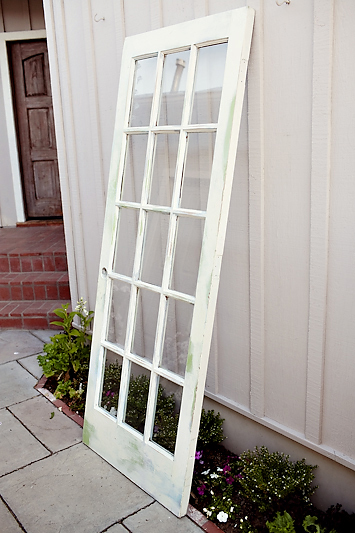 Measure the size of the window openings – in most cases they will be an odd size. 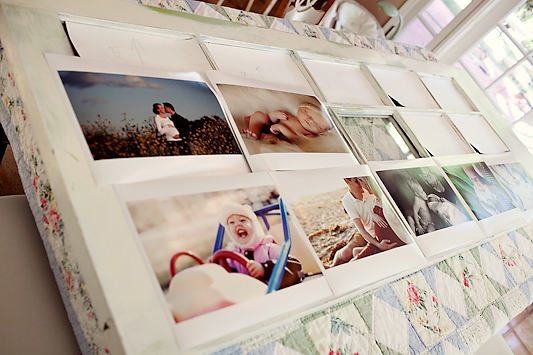 Mine were 9.5×13 – so I printed them on 11×14’s and trimmed them down to fit in the window. 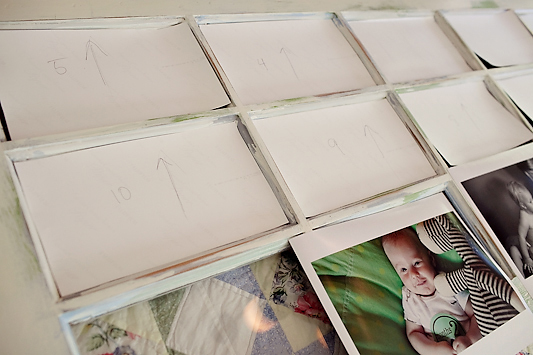 Once you trim the photos down to fit, number them and make an arrow pointing up so you know which way they go. Next, you need tape. 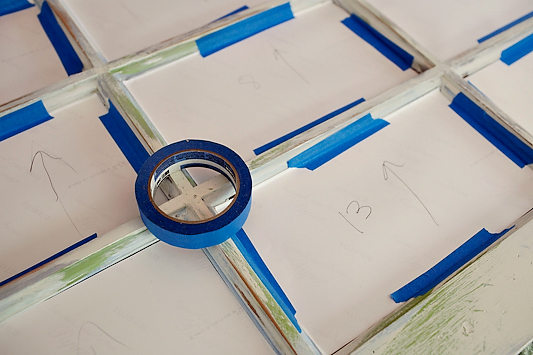 I highly recommend blue painters tape or masking tape – because it is forgiving and allows you to peel off and adjust it without destroying the photos. Lastly, you need 4 huge screws, a handy man and a level. Put that baby on the wall! After it was on the wall we added the hooks, so it could be functional too! 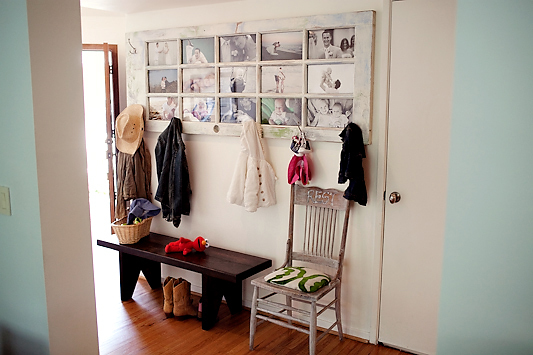 I am currently in love with this old door turned picture frame coat rack. 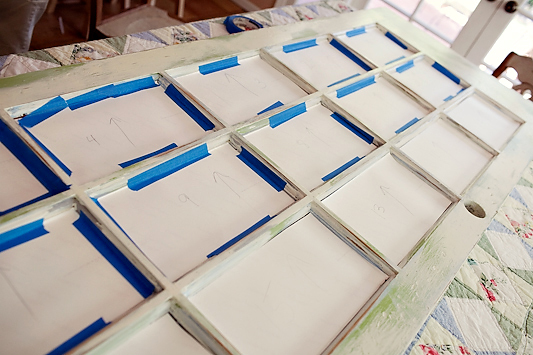 If you don’t have any photos to put in an old door – it’s not too late to learn how! 39 Ingenious Furniture Hacks You Ought To Try - Homesthetics - Inspiring ideas for your home. Previous post: an epic surprise! * a photo a week for one year! * 4 things to learn from frans hofmeester! * piper jane turns ONE! !